Today is officially the first day of spring (we’ll see what mother nature does), and it’s the perfect time to add some new style to your home…without breaking the bank! Here are seven ways to spruce up your interior as we welcome longer days, warmer weather and all that the season brings! 1. 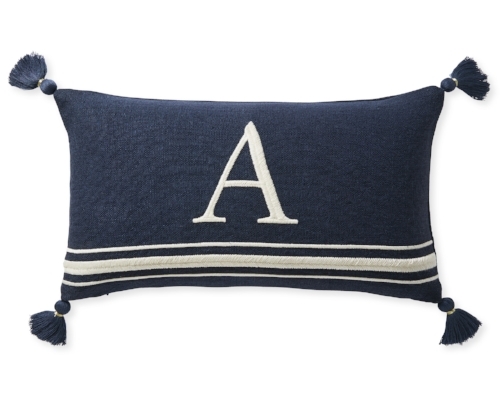 Update your accent pillows. Regardless of season, changing the throw pillows on your sofa or bed, is an easy way to update a space on a dime. If you have lots of neutrals, consider adding contrasting hues; if you have a more finite color palette, swap a geometric pattern for a modern floral or a solid for something with texture. I always recommend investing in down or high-quality synthetic inserts in standard sizes, so you can just wash your covers and swap them easily. 2. Treat yourself to fresh flowers or a new houseplant. Greenery is the best way to add some life (literally) to your home and, if you don’t think a plant is too much of a commitment, consider adding a decorative planter and a low-maintenance addition, like a ZZ plant (Zamioculcas zamiifolia). As a bonus, plants can improve your indoor air quality! However, if that’s too big a step or your four-legged friends won’t stand for it, stop by a local store and buy a few stems to arrange yourself. I’m a big fan of the hydrangeas from Trader Joe’s (about $6 for three stems) as they easily fill out a low vase and can last up to two weeks (with regular trimming and water changes). I also find the act of arranging flowers to be relaxing and a great way to de-stress….another bonus! 3. Add some color and decor to your door(s). A fresh coat of paint (and a new color) can do wonders for your walls but even updating your doors can create a stylish impact (and take a lot less time). If you have a street-facing front door, consider an accent color that coordinates with your exterior….and add a new doormat, wreath or planter while you’re at it. If you live in a condo, simply painting the interior (if you have restrictions) with a bold color adds tons of style. Need more tips? Southern Living has you covered. 4. Edit your kitchen countertops & dining room table. We’re all familiar with spring cleaning but have you taken inventory of what’s on your kitchen counters or dining table? Now’s the time to edit what’s out on your kitchen surfaces (what do you use daily and what can go in the cabinets or pantry) and perhaps add a functional accent piece, like a colorful bowl you can fill with fresh fruit and veggies from your local farmers market or a bright canister to store frequently used cooking tools. Similarly, refresh your dining room by adding a colorful runner to your table and simple accessories (maybe even those flowers you brought home earlier). 5. Let the sun shine in. 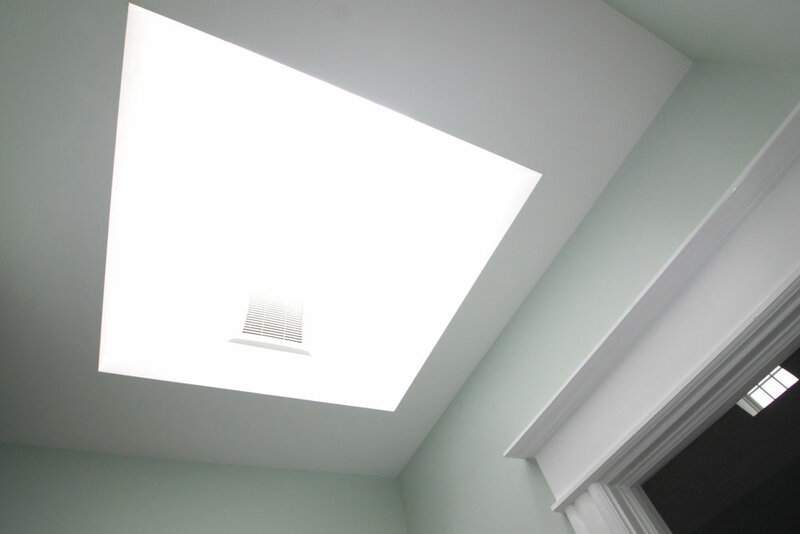 Take advantage of more hours of natural light by updating your window treatments. If you have curtains, consider swapping them for a lighter linen option, like the West Elm ones here. If you have blinds or shades, keep them open and add some sheers to frame and soften your window. Now’s the time to give your windows a good clean inside and out…you’ll be amazed at the difference! 6. 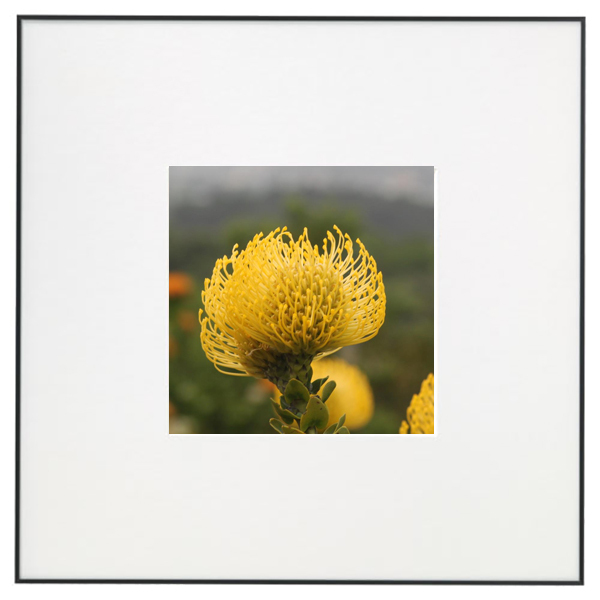 Bring the outside in with photography. One of my favorite DIY decorating hacks is to use photography and gallery frames to create inexpensive, meaningful and impactful wall art. Take your camera and grab some shots of the cherry blossoms and other flowers in bloom or find a talented friend and ask if you can print some of their shots you’ve hearted on Instagram. If you already have frames, just swap out the photos. If you don’t, head to Michaels for great deals on gallery-style frames (think narrow edges, modern lines and exaggerated white mats). 7. Re-style your shelves. If you have built-in bookshelves or a freestanding set, add some flower power with a removable wallpaper in the back (like this modern floral project from Top Shelf DIY). If you aren’t ready for wallpaper, simply start by removing all items from your shelves (and other flat surfaces) and carefully select pieces to add back in. Mix books with objects, framed items and other meaningful pieces. Less is always more. It’s hard to believe the holiday season is already upon us (even if some stores would have you think the Christmas season started in August). The winter months are the perfect time of year to re-imagine your interior spaces…and a great source of ideas for loved ones you are looking to shop for! 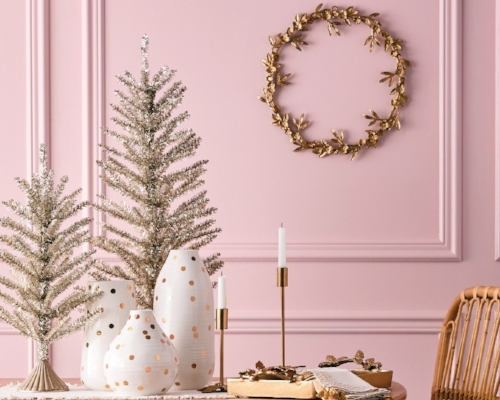 Here are ten of my favorite decorating finds (all under $100) that make great gifts this time of year (or really any time)! 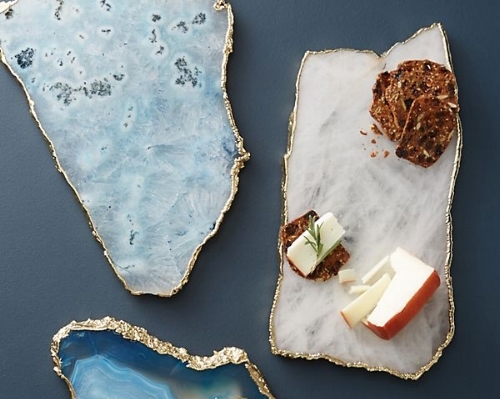 A cheeseboard is a great gift, but one can only have so many. What I love about this chic option is that even if your gift recipient has one, it can be used as a decorative item on a coffee table (put a few votives on it) or on your vanity. Lots of options to choose from, too! Decorative and functional for the kitchen, but also consider using in the bathroom, home office or as decorative pieces on a bookshelf. Mark & Graham is known for lots of quality gifts that can be monogrammed, like these pitcher and glass set (which I actually prefer without the monogram). This set will get a lot of use for everything from juice at breakfast to homemade cocktails! Give one or more of these fun vases to the home-lover who splurges regularly on fresh flowers and is a fan of great lines. This Thanksgiving, I had a chance to do something I hadn’t down for 20+ years…put together a puzzle. It’s a great indoor activity and even more fun when the image is your hometown. It even could be framed and become wall art when you finish! Candles may not be a unique gift, but an amazingly scented candle in a decorative container is the perfect hostess gift (and has life beyond that of the wick). If you are worried about choosing the wrong scent, stick with safer choices featuring vanilla, citrus and other crowd-pleasers. 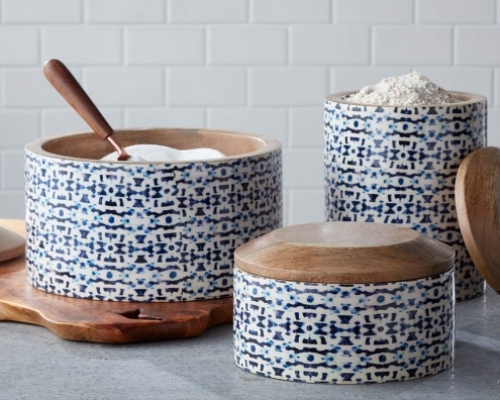 For the foodie or home chef, this set adds some fun to the countertop. Sadly, they won’t ship until next year but they were too cute not to feature. Consider these as an alternative! What’s winter without a cozy throw? I am a big fan of Barefoot Dreams for their softness, stretch and washability (I even have a larger version of this one on my couch now…received as a gift). 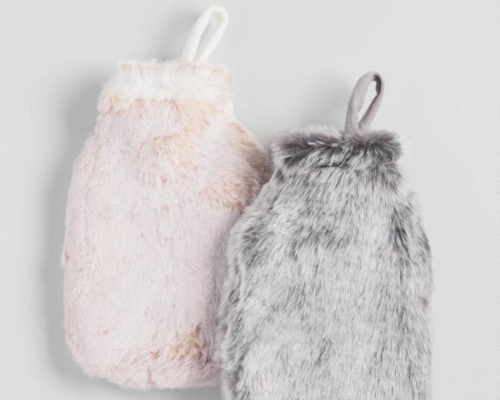 Even with more high-tech, longer-lasting options, there’s nothing like a hot water bottle to warm your bed in the winter or soothe an ache. Add in a soft faux fur case and your warm and stylish. And, if you still can’t decide how best to delight that home-lover in your life, consider giving them expert help with a gift certificate for decorating services from At Home DC…available in the DC area and for remote consultations! While I've always been interested and invested in interior design on some level (i.e.,I would redecorate my room as often as my mom/budget would allow in middle school), there's no doubt that the debut of Trading Spaces on TLC in 2000 was a big moment for me and millions across the country (and later around the world). As a junior at Georgetown University, TLC was always on in our dorms and living rooms (can't forget A Baby Story and A Wedding Story, too), and Trading Spaces had a great role in making interior decorating accessible. Fast forward to today where stores likes Home Goods and Wayfair and platforms like Houzz and Pinterest help individuals pull together their perfect space or, at the least, articulate their vision to a decorator or designer. Little did I know in 2000, that I would be working for the company responsible for TLC and Trading Spaces two short years later. Over 14 years, I worked my way to VP and also had a chance to meet a range of talent, including a few of the original designers. With the return of the series earlier this month, I thought it would be fun (and informative) to reflect on a few design lessons we can gleam from the cast (and that often come up as I'm consulting with clients). While there were always designers you loved to hate, I found myself drawn primarily to Vern Yip's work. Last month, I had a chance to meet Vern (again) at the Washington Design Center's Spring Market, where he gave the keynote, and his approach to timeless design remains. Trends will come and go, but classic lines, patterns and finishes aren't the opposite of "on trend." When creating a space, bigger spends are best spent on furniture and accessories that will pass the test of time. Layer lower cost, trendier pieces on top of those (think an accent table or decorative object) if you want to be "of the moment"...then you won't feel guilty when you want to move on. Laurie Smith was well known for spending the largest portion of her limited budgets on fabrics, adding color and pattern through silks and other luxe textiles. Throw pillows are a great way to update a space, whether a living room, bedroom or dining nook and you can find new and vintage fabrics to make custom pillows or search your favorite store for pre-made covers that make a statement through color, texture, pattern or special details like trim, fringe and beading. When choosing someone to partner with on your space, you want to have good communication and good energy, and Genevieve Gorder definitely always (and still has) both. Gorder always brought an energy to the rooms she designed not taking herself or the task at hand too seriously. Your home should bring you joy....so ditch that expensive white sofa that you hover over when guests sit down with wine and find furniture and accessories that are stylish and livable. 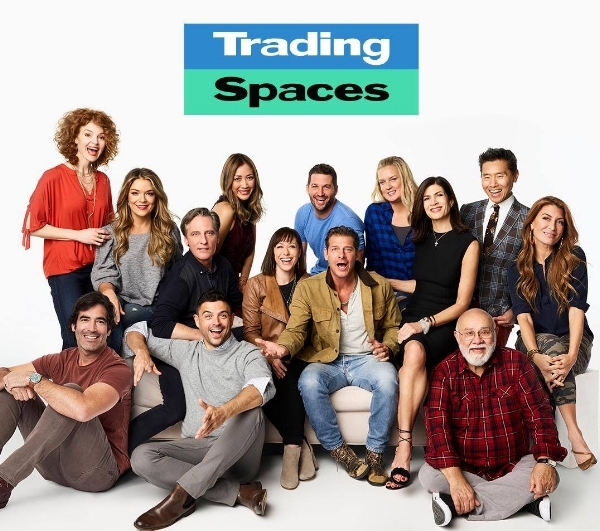 Were you a fan of the original Trading Spaces and/or are you watching the reboot? If so, what are the tidbits you've taken away and from whom? Even if we only spend a fraction of our day there, we place a premium on bathrooms. It's not uncommon for many of DC's row homes to lack a dedicated master bathroom but, often when they do have one, it's hardly a spacious five-piece en-suite. 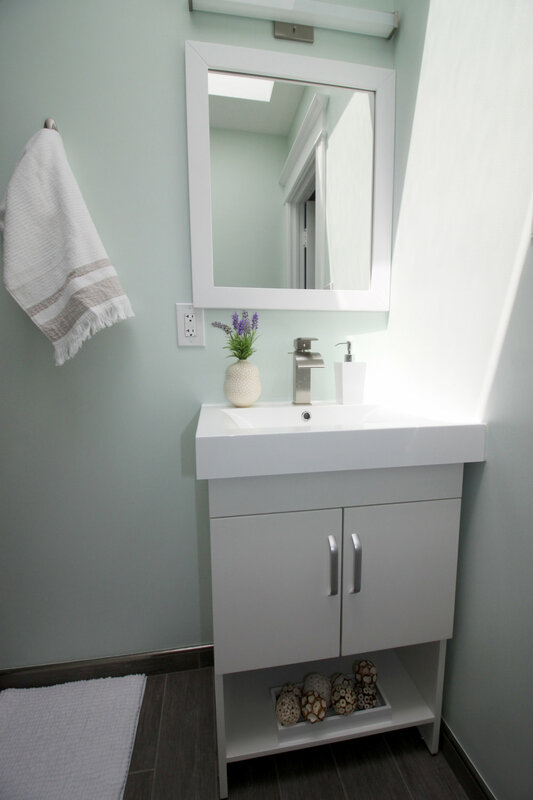 My clients recently had the chance to move to a larger home in the Brightwood Park neighborhood of Washington, DC, but their new-found master bath was dated and hardly a retreat (see below). While the small space meant there weren't any options for reconfiguring the layout (without undertaking a major renovation), we were able to radically change the feel of the space with new tile, new fixtures and combining some Scandinavian inspiration with natural elements. Keep your color palette simple. 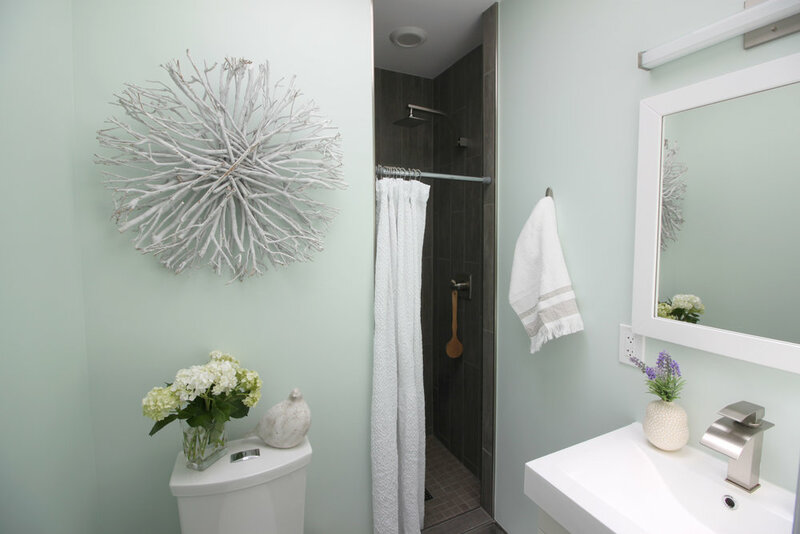 Less is more in terms of color when creating a serene space, especially a bathroom. 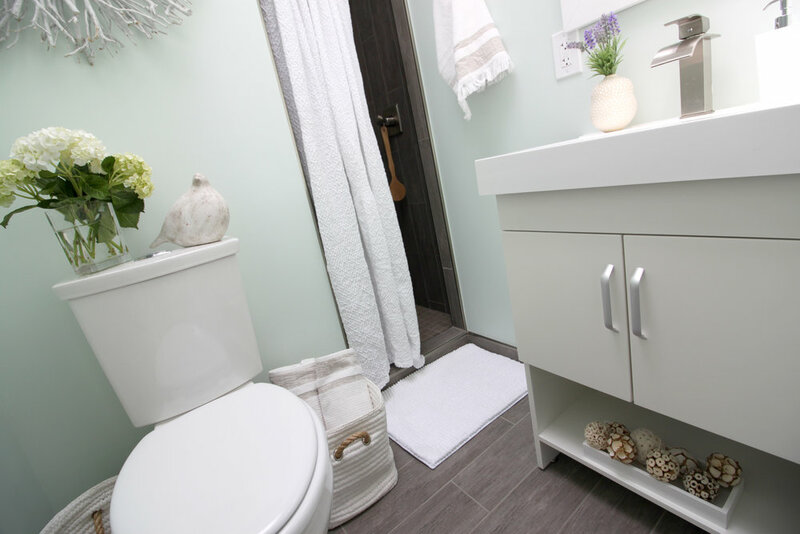 While white is the go-to for a spa-like feel, adding a contrasting but muted color (in this case a lighter shade of Sherwin-Williams Bonsai Tint, created by mixing in a little more white to tone it down) with a lighter wood tone (via our tile) takes this bathroom from basic to custom. Limit the type of tile (color, size and shape) to create a more spacious feel. For this bathroom, we used a 6" x 24" Driftwood tile (in Greywood) from Architectural Ceramics. 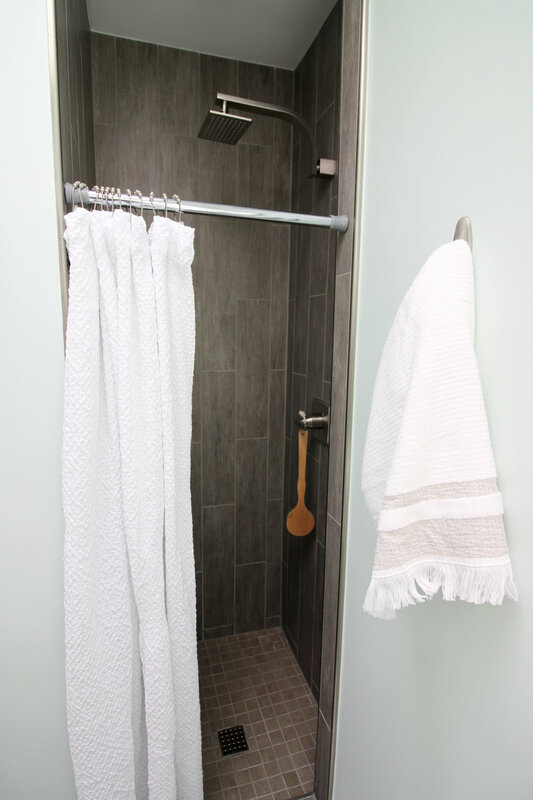 Meant to simulate wood planks, the tile was laid vertically in the shower to make the tight stall feel larger and horizontally along the floor to make the space feel wider. We did use a smaller scale 2" square tile for the shower floor, but you also could up the spa-feel by opting for a pebble floor (check out Island Stone's awesome options). Choose smart storage options. While less than 19" deep, the vanity selected features plenty of storage - concealed behind doors and using the open shelf at the bottom. While it may be tempting to add shelves above the toilet (as before), these would contribute to making the space feel smaller; alternatives, like a multipurpose baskets (as pictured below), allow you to store extra towels and toiletries in a stylish, mobile and contemporary way. Blend modern lines with organic materials and shapes. A clean-lined vanity and rectangular tiles could easily read cold but adding in natural textures, such as the twig-based wall art and the rope details on the waste basket and accompanying storage basket (all from HomeGoods), off sets the harder edges without going too country or rustic. All in all, I just love the way we were able to create a personal spa in such limited space for these deserving clients.